Aspiration Reviews - Is it a Scam or Legit? Aspiration is financial services website where you can invest your money three different ways. Their claim to fame is a pay-what-you-want fee structure. Investing can be an expensive endeavor, especially if your investment company is charging you confusing fees for their services. 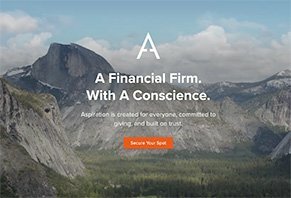 Aspiration.com, a financial services company that lets you invest your money in two mutual funds and/or a checking account, claims to make investing as cheap as possible by letting you pay what you think is fair for their services. The company’s founder is Andrei Cherney, a lawyer whose background is impressive: speechwriter for John Kerry and Al Gore, fellow at Harvard Kennedy School of Government, assistant district attorney. Aspiration’s funds are managed by UBS Banks, an international bank rated as a top-10 private bank by Advisory HQ. Think of Aspiration as the cool website that gets you to say “Yes” to investing, and then passes you cash off to UBS. When we saw Aspiration was becoming more and more popular, it made us wonder if their financial services were actually free, if there were any hidden costs and what kind of financial products they offer. Normally, our financial product reviews include the opinions of consumers, but since the company hasn’t taken on any investors yet, those opinions don’t exist. In this review, we’ll replace that section with a discussion about other low-cost investment vehicles we’ve previously analyzed. What Types of Products Does Aspiration Offer? Redwood Fund: Focuses on “companies whose sustainable, environment and employee practices result in their being poised for growth.” This is what is known as SRI, or socially responsible investment. Funds managed by UBS Bank. Flagship Fund: Focuses on “long-term growth with less volatility than the stock market.” Funds managed by UBS Bank. Summit Account: No-fee checking account with a 1.00% annual yield. Account provided by Radius Bank, an online financial institution. Basically, these three options offer you three different levels of risk. The Redwood Fund’s emphasis on companies “poised for growth” indicates there’s a bit of a higher risk because investments are made based on forecasts of growth that do not yet exist. The Flagship Fund’s mutual-fund composition offers less risk and is designed to weather the financial storms, while the Summit Account offers the least amount of risk and the least amount of return. The two funds require a $500 deposit and cap investments at $10,000, while the minimum opening deposit for the Summit Account is $10. Per their website, Aspiration will donate 10% of their revenue via micro loans to various charities across the United States. This program is called “Dimes Worth of Difference”. Pro tip: If you aren’t familiar with financial terminology, a “mutual fund” is a collection of different investment types. UBS portfolio managers control the fund, basically applying his or her expertise to your money so that you don’t have to. Aspiration’s No-Fee Structure: Is It Really Pay-What-You-Want? One of the things we’ve learned during our research of consumer financial products is that “great deals” or “fee-free” offers are rarely as great as they seem. Marketing has a lot to do with what consumers believe about a product. Our goal is to cut through all the marketing and make you a professional consumer through our research and healthy skepticism. So, when we first heard about Aspirations “pay-what-you-think-you-should” structure, we were a little skeptical. Financial companies, after all, need to make money to operate, and Aspiration is no exception. It’s not a non-profit; it’s an investment company who wants to make money. When we read over this for the first time, it was a bit of a surprise considering how heavily Aspiration’s unique fee-payment structure has been promoted by the company and covered by the press. However, it’s not a complete surprise; as we said earlier, consumers need to cut through all the marketing and see a product – financial or otherwise – for what it really is. Based on what we read in the WSJ¸ consumers could easily be misled by Aspirations claims that you only have to pay what you want for their services. In reality, you’ll already be paying a fee of, according to the Wall Street Journal, about 1.72%. Now, in the grand scope of the investing world, 1.72% is standard – the average fees are for the type of funds that Aspiration offers is about 1.75%, Damato wrote. What is not standard is that Aspiration doesn’t force you to pay fees. Most financial advisors or investment firms will either charge you a flat fee or a commission for their services. But, how do those fees compare to robo-advisors who charge low fees for their services? We’ve reviewed several of the most popular robo-advisors, which are apps that invest your money into something called ETFs, or exchange-traded funds. These funds are made up of a diverse group of assets and are designed to mimic the growth of the top funds on the market. If some parts of your ETF start to do bad, an algorithm in the robo-advisor picks up on the downward trend and automatically trades the bad performer for a good one … this process is called rebalancing. Basically, these robo-advisors are the autopilot version of investing. Some really smart people came up with an algorithm that does everything for you; it steers the ship while you relax and enjoy life. If you want a more in-depth explanation of ETFs, head to Investopedia’s exchange-traded funds page. Betterment: $3 per month when you deposit less than $100/month, 0.35% on monthly deposits at or above $100. Fees drop to 0.25% per month when your balance hits $10,000. No minimum deposit. WealthFront: Free for balances up to $10K, 0.25% after that. Minimum deposit is $5K. Acorns: $1 per month for accounts under $5K, 0.25% for accounts above $5K. No minimum deposit. As you can see, the fees on these robo-advisors are lower than Aspiration’s fees. The drawback, however, is that these three apps don’t offer SRI options. So, for the socially-conscious investor, it may be worth the higher fees at Aspiration to invest in SRIs. Aspiration’s pay-what-you-want model is a nice idea, especially since consumers have grown weary of bank fees and institutional greed. Their Redwood Fund provides investors with a chance to put their money toward sustainable, environmental and employee practices. These companies are poised for growth, which indicates a level of risk you don’t find with the Flagship Fund. The Flagship is built for long-term wealth that rides out the ups and downs of the market. The third product, Aspiration’s Summit Account, is the most stable investment account but has a paltry guaranteed yearly return of 1%. After doing our own research and comparing Aspiration to robo-advisors like Betterment, WealthFront and Acorns, we’ve come to conclude that, while Aspiration isn’t a new idea, per se, it’s nuanced enough to where it could appeal to someone who wants their money to go to a “good cause” and have the chance to see return on their money. The company’s Dimes Worth of Difference is a nice perk for the giving-inclined consumer, and it, to a certain extent, adds a new twist of generosity in what’s perceived as a greedy, cutthroat investment world. It’s hard to argue with their pay-what-you-want philosophy, although this program does mask the fact that you’ll be paying, according to a 2014 Wall Street Journal article, 1.72% in maintenance fees. If you aren’t sure about investing with Aspiration, feel free to read up on Betterment, WealthFront, Acorns and other robo-advisors. Also, check out the guide we wrote on robo-advisors – it will help you understand how they came into being and why they’re so popular. What was supposed to have been my new primary bank account has now been locked out for 6 business days. I was told to upload a government picture ID and PDF copies of my linked bank account statement, which I provided under an hour after the requested email was received. There are reviews piling up on other websites, and I have seen reports of at least six other account lockouts in the past couple of weeks. Aspiration has responded to me on Twitter and via other direct message channels telling me to be patient, but they have given me no information as to why this has happened or an ETA for when I will have access to my account. Aspiration took out $5,000 out of my bank account, unauthorized to open up a Spend & Save Account, which I did not want. I told them numerous times to put the money back and this is NOT what I wanted. I've had to file a lawsuit against them to get my money back. DON'T do business with them. They are a scam and a thief! I have been with Aspiration for about three years now. At first, it was amazing, but then just this year, in February, my account was locked for no reason. I have called and emailed only to receive nonchalant responses. One representative, Joseph, even sent me a closure form and said that once I transfer my money out, I can close. Here's the problem - my account is still being held hostage, and no one is responding to my calls or questions via email. They are absolutely horrible to deal with. I'm lucky this isn't my only bank account, because I would be in terrible straits right now. Aspiration migrated after a month with no account. I finally got the account active, and I was provided the wrong routing number. I have been trying to contact them for over three weeks. The only way to contact them is email, in the meantime, I cannot access my funds. To add to the frustration of the transition, I am now having issues paying my bills because the routing number is not a recognizable routing number. I am having to sign up for Bill Pay (called Payments through Aspiration and can only be done via their mobile platform, which is the dumbest thing I have ever heard of). Every one of my bills is going to be late now. Ever since I signed up with this company, it has been a hassle. The transition has just made it worst. The new tracking system does not show when you have paid a bill. For example - when I paid my rent, it posts as "ACH Withdrawal." Not as a payment to a company. This makes it EXTREMELY hard to balance your account at the end of the month. I now am having to keep a paper record of bills that are paid directly out of my account so that I know what was paid to which company. Lots of issues. While the fee-free banking is awesome, the hassle is not worth it. Although I am a new customer of Aspiration Bank, I'm not new to all the 'tricks' people claim banks use. I work for Bank of America and I know a great deal compared to a raw deal and Aspiration Bank is the former. My sole intentional use for Aspiration Bank’s Summit Account is to use it as a savings account which offers great returns compared to Bank of America or my local brick and mortar bank (which will go nameless because it’s a great bank that is monthly maintenance fee (MMF) free). I have yet to overdraft any of my bank accounts (knock on wood), but if you’re the type of customer that constantly overdrafts your account, you’re going to have a bad time no matter who you bank with. With that being said, I know what I’m getting myself into with Aspiration Bank and will be using my local brick and mortar bank for direct deposits, cash deposits, check deposits, and for transferring money into Aspiration Bank. As far as Aspiration Bank’s Red Wood and Flagship Fund, I think I’ll be consulting my accountant for better options as, indicated by this article, robo-advisors charge less in fees. I will come back in a few months and keep you updated of my true review, but for now, it's five stars. Write a Review for Aspiration!